Tooth-coloured fillings generally refer to composite fillings, which consist of a tooth-coloured plastic and glass mixture bonded to the tooth surface. Commonly used to replace unsightly amalgams or restore decayed or broken teeth, producing a beautiful natural result. Michael attended Smilemakers unhappy with the appearance of an old composite filling on his front tooth. The filling was stained and the colour match poor. After discussing the options, a solution was found in replacing the filling with a new composite filling, giving a simple solution that blends in naturally with the remaining tooth. What are the disadvantages of composites? 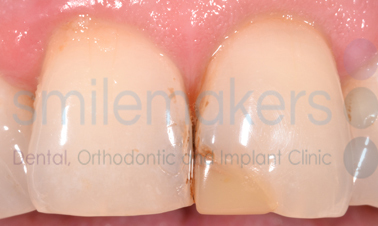 This type of filling can break and wear out more easily than metal fillings, especially in areas of heavy biting force. 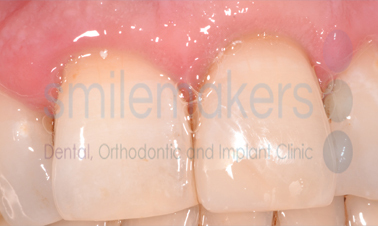 Therefore, composite fillings may need to be replaced more often than metal fillings. Please discuss this with your dentist as this will vary from tooth to tooth. Compared to amalgam fillings, composites can be more difficult and time-consuming to place.